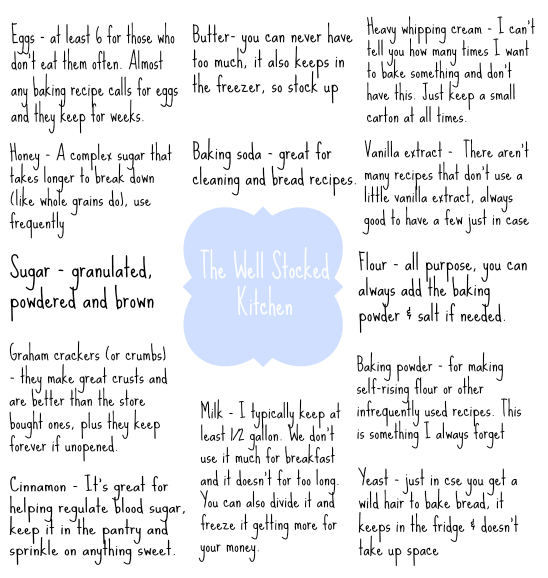 Have you ever got a hankering to bake something only to find out you don't have one or two ingredients you need? This happened to me over the weekend. It's one of the things I miss about living at my parents' house. My mom has probably the best stocked kitchen in the world. The only time she didn't have what you needed was if it were some very obscure spice, and even then it's probably there if you search hard enough. I racked my brain thinking about all the things I typically use and came up with a few lists. The first is for baking and desserts, something I absolutely love to do when I'm not swamped with tests or tons of work. Such a great list - I always want to bake and feel that I would need to buy too much to make this happen! Pinning your list! Thanks for making this list! I just moved and I definitely need to restock all my baking supplies. awesome list! don't moms always have everything? ?